The HBO produced political comedy series Veep is based on the work of the office of a fictitious Vice President named Selina Meyer, played by Julia Louis-Dreyfuss. Veep was created and co-written by Scottish comedian Armando Ianucci with British comedy writer Simon Blackwell. Ianucci's British political satire The Thick Of It is the inspiration for and uses the same style of filming and comedy as Veep. First broadcast in 2012 in the U.S. on the cable network HBO and in the U.K. on the Sky Atlantic satellite channel. Veep is the second attempt to transfer the highly successful The Thick Of It political sitcom format to an American environment. The first in 2007 was not picked up for a full season following an unsuccessful pilot produced by ABC was based more closely on the characters of The Thick Of It. Ianucci's The Thick Of It was first broadcast in the U.K. in 2005 and is best known for the foul mouthed Director of Communications Malcolm Tucker played by Peter Capaldi. Unlike the British show Veep does not make any attempt to portray the political beliefs or political party of the main characters. 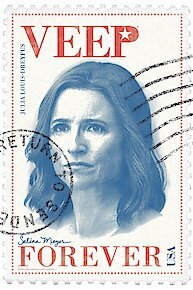 The eight episode first season of Veep contains a story arc explaining Selina Meyer's ambition to secure a political legacy through a Clean Jobs Bill and how her ambitions are betrayed by her low level of popularity. Armando Ianucci and Simon Blackwell have collaborated on a number of British television shows, and worked together on the fim In The Loop. Based on characters in their The Thick Of It show In The Loop won the pair an Academy Award nomination; Julia Louis-Dreyfuss won a 2012 Emmy for her role as the U.S. Vice President. HBO commissioned a second season of Veep following the completion of the first season in 2012. Selina and team head to South Carolina, where she seeks an endorsement from a key leader. Gary gets a long-awaited promotion, while Marjorie excels in her new role. At an Aspen retreat for rich donors, Selina deals with potential adversaries and allies. Amy's behavior raises Gary's suspicions. Selina and her team prepare for the long-awaited groundbreaking of her library; Amy seeks clarity on her role; Jonah asks Dan, Ben and Kent for help. Selina's book finally arrives; Jonah has a big meeting; Dan, Ben and Kent grab a drink. Selina takes a trip; Dan woos Jonah to get a coveted interview; Amy convinces Selina to put her in charge of a very disorganized Mike. Selina tries to finish her book. Selina and her staff prepare for her portrait-unveiling ceremony, while Jonah tries to weasel his way onto the guest list. Dan works on his onscreen-chemistry problem. Selina settles on a location for her presidential library. Dan lands in a gossip column. Mike and Selina work on her book. Jonah tries to cement a big donation. Gary manages a mini-crisis at Madame Tussauds. Selina and her team attend the funeral of a Supreme Court justice. Amy works on securing a location for Selina's library. Dan tries to maintain his upswing with Jane, his co-host. Jonah finds an issue. Selina goes to the opening of President Hughes’ library. Jonah receives advice on how to climb the political ranks; Dan suffers through Jane’s impulses; Amy releases an attack ad. A year after losing the presidency, Selina tries to safeguard her legacy. Dan attempts to adjust to his new job. Amy’s brash D.C.-type personality end up being too much for her new co-workers. She looks pretty happy on her Hawaiian vacation, too. The First Lady's tone-deaf fashion choice sparked lots of insults. The 'Veep' star shared a health update with fans this week. The actress is currently undergoing treatment for breast cancer. The actress broke the news to her fans via social media. Is This the End of the Line for 'Veep'? HBO's hot comedy series is ready to call it quits. Some trolls, predictably, weren't happy for him. The actor has recently begun stepping out publicly with his new love. T.J. Miller won't be back next season, though. Trump impersonations get ratings, and the cable network wants some of that action. Veep is currently available to watch and stream on HBO. You can also buy, rent Veep on demand at Amazon Prime, Amazon, HBO GO, HBO NOW, Vudu, FandangoNow, Google Play, iTunes online.